. The Convict Lover | Book Club Guide . 1. “A letter,” observed Emily Dickinson, “always seemed to me like immortality.” Letters often outlive the people who write them, providing a valuable record of daily life, of events rarely preserved by historians. Yet they are private documents, often intimate, written in unguarded moments to a particular individual, never intended to be read by anyone other than the recipient. Discuss the ethics of reading other people’s mail, even long after they are dead. 2. How would you describe Joe? Did your impression of his character change over the course of the book? Was his failure to make good on his promises to Phyllis a surprise? 3. The relationship that Joe and Phyllis embark on is a dangerous one for them both. Tobacco, and the comforts it can buy, is the obvious pay-off for him. But is there more to his interest in Phyllis than that? And what motivates Phyllis to risk so much? What role do the letters play in both their lives? 5. How is the revelation of Phyllis’s relationship with the convict received by her family? Why do they allow it to continue? Discuss how a family might react to a similar revelation today. How do you account for the differences? 6. The correspondence that survives may only be a fragment of what passed between Joe and Phyllis. He may have continued to write. He may even have visited. Based on what can be gleaned of Joe’s character from his letters, discuss other possible endings to this story. 7. Prisons have changed a great deal in the last hundred years, yet many ex-cons have written to say that their experience of incarceration was just like Josie’s. Discuss the nature of loss of freedom and its effect on an individual. 8. To some extent, Josie’s letters are the most fictional part of the book. He reinvents himself for Phyllis, secure in the knowledge that she will never find out the truth. Letters – whether mailed or emailed or hidden in a stone crevice – allow us to become someone else. Discuss the ways in which both Phyllis and Joe elaborate on the truth. Compare their relationship to an email romance today. 9. 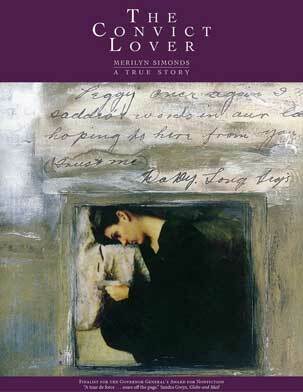 The term “convict lover” is used only once in the course of the book, in reference to one of the main characters. In some ways, though, Phyllis, Josie, and William St. Pierre Hughes might all be considered convict lovers. Discuss. 10. The epistolary form of narration is not new to literature, but it has rarely been used in Canada. How well do the letters work to reveal character and setting and to further the plot? How might the book have changed if the letters were used only in fragments or as background documents in the writing of a novel about Joe and Phyllis? Would the results have been as moving? Choice and chance are the great definers of history. Phyllis Halliday chose to keep those letters. When she died, her niece cleaned out the attic, hauling bags of old papers to the dump. By chance, some were left strewn across the floorboards. Over the next few years, several people lived in that house, but none chose to explore the attic, or if they did, they let it be. By chance, a writer moved in and on August 8 – Phyllis’s birthday – she climbed up and found a story. What we know of the past is so accidental, so dependant on the whims and desires of both the person who saves a document and on the person who finds and interprets it, that to put much store in the “facts” of history seems ludicrous. Even historians like Simon Schama admit that there is no such thing as objective history. Everything we know about the past has been filtered first by the people who lived it and again by those who try to piece it together again from what is left behind. So is, this story of a prisoner and a village girl true? Yes, in that these people lived and corresponded in Portsmouth vilage in 1919 and 1920. But did they do so with the motivations I ascribe to them? I don’t know. I was rigorous in my research and ruthless in my search for emotional and factual truth, but in the end, no one can ever know what was in their hearts. What I found in the attic was not a neat bundle of 79 letters. Hundreds of pages blanketed the floor, some written by Joe Cleroux but most of them belonging to other letters and pamphlets, for Phyllis had saved everything. My first task was to separate out the pages from Joe, then I had to arrange them into discreet letters. Luckily, because he’d stolen most of his writing matierals, I was able to reassemble the letters by comparing the shape of the paper or the kind of ink or pencil he was using on a particular day. Run-on sentences helped, too. It took the better part of a year to arrange the pages into letters. Then, I had to put them in chronological order. Only three were dated: Christmas, Easter, and St. Patrick’s Day. The rest were inscribed not with the day they were written but with the day Phyllis would find them in the quarry. However, there were certain internal narratives that helped to order the letters: the saga of Josie’s haircut, the anticipated arrival of the new warden. And Joe often mentioned events in the natural world – the first robin, a big snowstorm, a thunderstorm in the night. Hoping to put dates to these happenings, I began to read the local newspapers. For nine months, from October until July, I spent every morning at the library, immersed in the Daily British Whig and the Kingston Standard. I made note of all the weather reports (including the one time that it rained three Fridays in a row), every mention of Portsmouth village and the penitentiary. It was from the newspapers that I learned about the strike at Canadian Locomotive and the vacancies in the top staff of the prison. I began to see a context for the story of Phyllis and Joe. For most of a year, I lived in the world of post-World War One Canada, avoiding all contemporary media, to the point that one evening, while at a party, I exclaimed at the awful plane crash north of the city, and seeing the blank stares of my friends, it suddenly dawned on me that I was talking about an accident that had happened seventy-five years before. To me, it seemed like yesterday. The Greek philosopher Heraclitus said it 2,500 years ago: you can’t step into the same river twice. Reality cannot be relived. It can’t even be reconstructed since the bits and pieces that come to us from the past are inevitably incomplete. The best you can do is try to recreate what was. The letters are real documents. The rest is imagined, of course, though in recreating the narrative that weaves the letters together, I kept myself on a very short leash. If I describe Phyllis wearing a green dress on a cloudy afternoon, you can be assured she owned a green dress anad that the sun didn’t shine that day. To try to imagine the convict’s life, I manacled my hands to a lintel for hours. I stayed in a room the size of a cell for 40 hours straight. It was nothing like the real experience of imprisonment, but it gave me some appreciation of the physical effects, at least. I learned as much as I could about the place and the time and the specifics of Josie’s world and Phyllis’s, then I tried to put the people I knew from their letters and diaries into those situations. It wasn’t fiction so much as speculative recreation. I was often tempted to invent letters from Phyllis, but to do so, would have thrown the truth of Joe’s letters into doubt. Which is ironic, since although the letters are “real,” they are in many way, the most fictional part of the book. Joe made up the details of his birth, his family relations, his criminal past out of whole cloth, giving himself far more license than I gave myself. When I was writing this book, there were no models, no genre that it fit into easily. It wasn’t a novel, although many refer to it as such and it is often shelved in the fiction section of bookstores. But it wasn’t nonfiction either, since the thoughts and feelings of the characters are clearly my invention. I wasn’t willing to falsify the names in order to make the book fit more comfortably into fiction, and neither was I willing to forego the narrative to make it conform to the standards of nonfiction. And so The Convict Lover rests somewhere along the continuum between fact and fiction, at a place where stories, though true, can still be told as stories.